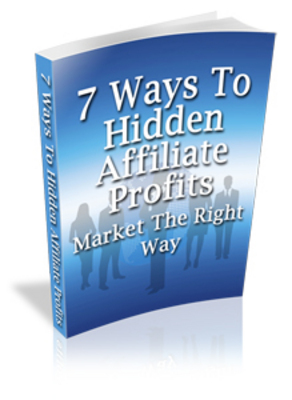 7 Ways To Hidden Affiliate Profits is the eBook that youve been waiting for to boast your online income. If you have struggled to sell affiliate products in the past, then you know how valuable this book can be. Affiliate marketing can provide your business with a reliable channel of income month after month. Effectively selling affiliate products doesnt require magic, voodoo or anything supernatural. Affiliate marketing doesnt need to be a complicated or complex process either, but its important to remember that affiliate marketing is a business just like any other and to succeed you need to be pointed in the right direction. Let 7 Ways To Hidden Affiliate Profits guide you so you can learn things right the very first time. Everyone works best in their own way and its important to note that there is no best way to create your own personalized affiliate marketing plan. You must, however, realize that there is a very clear distinction between doing things your way and doing things wrong. Are you confident that the knowledge you currently process is enough to take you where you want to go? If not, then this is one eBook that you cant afford to live without.